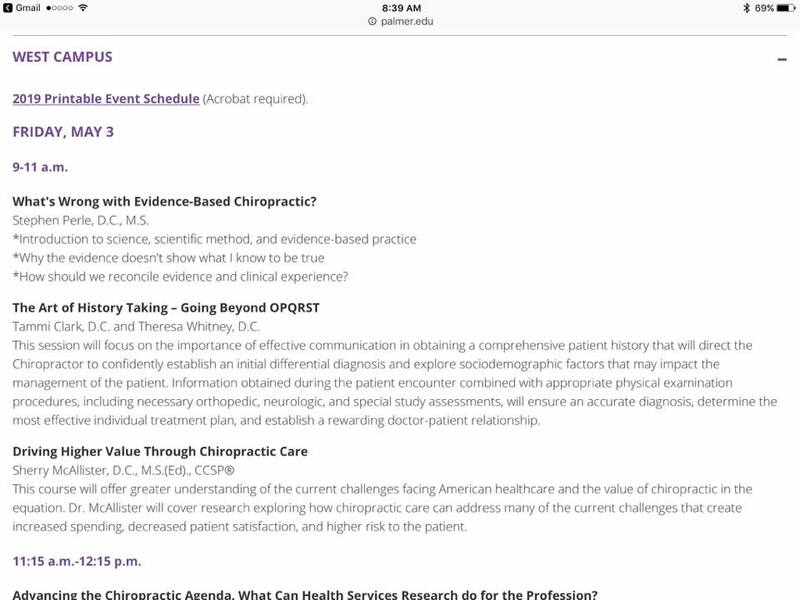 According to the schedule for Palmer West Homecoming May 3-5, 2019 Stephen Perle DC will be presenting on Evidenced Based Practice in chiropractic during the Homecoming event. Perle is Professor of Clinical Sciences in the chiropractic department at the University of Bridgeport College of Chiropractic (UBCC) and has been a faculty member since 1991. He also serves as chairman of ACA's Research Advisory Board. Besides his role at UBCC Perle is also a consultant to the State of Connecticut, Department of Public Health, Division of Health Systems Regulation since 1996. The Connecticut Board of Chiropractic falls under this Division. Perle is also the immediate Past President of the West Hartford Group which is rife with subluxation deniers including Michael Simone DC who serves on the Colorado Board of Chiropractic. The issue of evidence based chiropractic has been getting a lot of attention lately as the Subluxation Deniers like Perle seek to re-define evidence based practice in ways that exclude anything other than what they refer to as "high level evidence" i.e. randomized controlled trials. This tactic has been effective in places like the United Kingdom, Australia and Canada where chiropractors managing vertebral subluxation in a vitalistic, salutogenic fashion have come under attack by the very chiropractors who regulate them. The focus now has turned to the damage they can do in the United States after their success in these other countries. Unfortunately schools like Palmer give them a stage and the support to spew their nonsense. While Palmer positions itself as the "Fountainhead" of chiropractic it has become increasingly clear that Palmer is being run by a board and Administration that is heavily influenced by the American Chiropractic Association (ACA) and related subluxation deniers. Despite Palmer's claim to hold vertebral subluxation as a cornerstone of its chiropractic educational training, it appears much of the leadership of Palmer embraces the American Chiropractic Association (ACA) and its new brand - a brand that includes extremely restrictive standards of care that do not allow for the taking of radiographs to determine the biomechanical components of vertebral subluxation nor the taking of post x-rays to determine the correction of such components. According to an article in Palmer News, Palmer praised the "prominent presence" and "strong participation" of Palmer West at the National Chiropractic Legislative Conference (NCLC) put on by the ACA that included Palmer West students, alumni and administrators. NCLC is billed as " . . . the annual meeting of the ACA, highlighted by an Advocacy Day on Capitol Hill, when students from the U.S. chiropractic colleges join doctors of chiropractic throughout the country to meet with senators and representatives to update them on the state of chiropractic and ask for their support on key legislative items to improve patient care and the future of the profession." Meeker's praise for the ACA comes on the heels of Palmer Chancellor Dennis Marchiori DC lauding the ACA's re-branding efforts in a letter to Palmer Alumni. In his letter to Alumni, Marchiori made no mention of vertebral subluxation. Instead, after praising the ACA, Marchiori stated it did "... not support the narrow scope of plain film use endorsed by the ACA" and went on to state that clinical decisions are "not typically black and white". Marchiori urged practitioners to consider the very things the ACA is promoting such as the dangers of exposure to ionizing radiation, the costs associated with it, and the inconvenience of time for the patient. Perle, as it turns out was the Keynote speaker at ACA's 2018 Legislative Conference in DC. In what appears to be a disturbing trend among chiropractic college leaders, the Board of Trustees at the "Fountainhead" of chiropractic - Palmer, joins the growing list of school leadership that are heavily influenced by the American Chiropractic Association (ACA).